As mentioned in the “Meet The Dentist” section, Dr. Nick completed a comprehensive educational training program focused on meeting the dental needs of infants, adolescents and special needs adults. Following completion of his four-year dental school curriculum, Dr. Nick completed a two-year, intensive program to become a specialist in pediatric dentistry. Therefore, with the additional training, pediatric dentists are to dentistry what pediatricians are to primary care/internal medicine. Children have a different set of teeth than adults. When establishing prevention and treatment goals, special consideration must be paid for these unique baby teeth and the adult teeth developing below them. Additionally, the timing in which the baby teeth will fall out and the adult teeth will erupt is an important component to keep in mind. Additionally, children may have specific behavioral and medical needs that Dr. Nick is accustomed to considering. Dr. Nick and his team have the experience to build strong and trusting relationships with their pediatric patients and the education to accommodate the unique needs that younger patients present. Baby teeth allow for proper chewing. Proper chewing leads to appropriate nutrition. Appropriate nutrition encourages growth and development. Literature shows that cavities in teeth can lead to malnutrition, poor growth and slowed development as a result of pain and discomfort associated with chewing. Therefore, healthy baby teeth aid in ensuring that your child continues to grow and develop into his or her full potential. Studies have shown that cavities in primary and permanent teeth lead to greater school absences. These absences may be related to the child experiencing discomfort or attending dental appointments. Time away from school decreases your child’s social and educational stimuli. Maintaining health of primary teeth translates to more time in school! The different layers (enamel, dentin, pulp) of primary teeth are thinner than permanent teeth. Because of this, cavities can progress through these layers more rapidly. Progression of cavities to deeper layers of the tooth increases the likelihood of pain, infection, swelling and abscesses. Cavities in baby teeth are a large predictor for cavities in permanent teeth. Preventing cavities in baby teeth is a logical step towards creating a healthy mouth for a child’s life. Primary teeth are critical to proper development of jaws and guiding permanent teeth to place when they erupt. If primary teeth are lost early due to decay, permanent teeth are less likely to erupt into an ideal position. Improper position and alignment of primary teeth will ultimately extend orthodontic treatment time. Baby teeth aid with development of appropriate speech patterns. As a pediatric dentist, Dr. Nick is trained to recognize inadequacies in speech and language development, if present, and make appropriate referrals to a speech pathologist. Children and adults alike take great pride in their smile. If a child is embarrassed of his or her smile due to missing teeth or cavities, then this may have detrimental consequences to his or her developing psyche, self-esteem and confidence. Ensure your child maintains a positive self-image by encouraging brushing twice a day and flossing once a day! Maintaining appropriate oral hygiene is a skill. Children who appropriately care for their primary teeth learn this skill early in life. This skill will then transfer to caring for their adult teeth. It is important to excel in this skill by the time permanent teeth erupt since these will be present much longer. Typically, the first tooth erupts into the mouth between 6 and 12 months of age; however, this can range from teeth being present at birth to initial eruption beginning at 15 months of age. Gums can be tender or sore while baby teeth are erupting. If your child seems to be in distress as a result of teething, rub the sore gums gently with a clean finger, a cold, wet cloth or perhaps the back of a cold spoon. Allowing your child to bite on a cold teething ring may also help with the discomfort. If none of these options seem to alleviate your child’s teething symptoms, giving him or her Children’s Tylenol, Advil or Motrin may help. For the first 6 months following eruption of your child’s teeth, they have an increased susceptibility for cavity formation. For this reason, it is especially important to reduce the amount of sugar your child consumes and ensure brushing during this period. Additionally, precaution should be taken not to put your child to sleep with a bottle containing milk, formula or juice. While awake, saliva can remove the acid from the tooth surface (see How do cavities form?). However, while sleeping the amount of saliva present in one’s mouth is reduced. This means acid will be kept in contact with the tooth surface for longer and the possibility of cavity formation is greater. Your child’s teeth begin forming before birth; in fact the first evidence of tooth tissue formation is during the 6th week in utero! Anytime between birth and 15 months of age, the first primary or “baby” teeth can be seen erupting, or pushing, through the gums. Typically the bottom front four and the top front four are the first to erupt and the remaining baby teeth (20 in total) grow in by 3 years of age. Adult, or permanent, teeth begin erupting around age 6, beginning with molars behind the baby teeth and the lower front teeth. This process continues until approximately age 12 (when the second molars erupt). Adults have a total of 32 permanent teeth: 28 can most often be seen in the mouth and 4 wisdom teeth which typically are removed or remain beneath the gums. Appropriate dental care is critical for children to learn and practice. If appropriate dental care is not instilled at a young age, dental problems may develop in baby teeth and ultimately adult teeth. Literature shows that cavities in baby teeth are a direct predictor for cavities in adult teeth. For this reason, establishing great oral hygiene habits early in life will increase the chances that your child will have healthy teeth for the rest of his or her life. Once your child’s first baby tooth (usually the lower front) comes into the mouth, it is time to begin brushing his or her teeth twice daily and make your child’s first dental appointment. Brushing at this age should be done with a small-headed, soft-bristled toothbrush. Dr. Nick and the American Academy of Pediatric Dentistry recommend using a rice grain size of fluoridated toothpaste while brushing until the child is 3 years of age; from ages 3-6 years we recommend using a pea-size amount. Flossing should begin once adjacent teeth contact one another. Parents should help their children brush their teeth until they have the manual dexterity to write or tie their own shoelaces, typically age 7. If I want to clean my child's teeth, what should I use? A soft-bristled, small-headed toothbrush is the most effective means by which to clean your child’s baby teeth. Dr. Nick recommends using fluoridated toothpaste when doing this (for recommendations on amount, see the “Infant and Toddler Oral Hygiene” section). If your child absolutely will not tolerate toothpaste, try to introduce it gradually. If your child absolutely will not tolerate brushing with a toothbrush, begin by simply wiping his or her teeth with a clean, wet cloth. Does thumb, finger or pacifier sucking cause permanent problems to my child’s teeth? Thumb, finger and pacifier sucking can be considered a normal activity for most infants. If continued beyond age 3 years, these habits have the potential to cause significant problems to the bone surrounding a child’s baby and adult teeth. These problems can lead to crooked teeth and problems with the child’s bite. If you are concerned about your child engaging in any of these habits, Dr. Nick would be happy to evaluate your child and suggest ways to help him or her discontinue it, if necessary. If your child consumes food or beverage with sugar, the sugar will be processed or metabolized by bacteria in dental plaque. A by-product of the metabolism is acid. The acid then attacks tooth enamel (the hard, external covering of the tooth) and makes it weaker in a process called demineralization. Each time sugar is consumed, the acid produced by bacteria attack the teeth for 20 minutes. Therefore, decreasing the frequency with which your child consumes sugary food or beverage will minimize the overall time per day in which your child’s teeth are under acid attack. This will lead to a healthier, more cavity-free mouth! What is plaque, tartar and calculus? Plaque is invisible and is composed of living bacteria, food debris and saliva. Prolonged presence of plaque can lead to cavities and irritate gums. Plaque can be removed with a toothbrush. If not removed, plaque will harden and become tartar (also called calculus). Once plaque turns into tartar, only a dentist has the correct instruments to remove it. Tartar will further irritate and inflame gums while releasing toxins that cause bone removal and the initiation of periodontal disease. Brushing one’s teeth is effective for removing plaque and food debris from visible tooth surfaces; however, it is ineffective at cleaning the hard-to-reach areas between teeth. If food and bacteria are left between teeth, then this is prime real estate for the bacteria to cause decay and gum (or periodontal) disease. Flossing once a day is a critical component to cleaning these hidden areas and thus preventing such problems. Daily flossing is an important step towards ensuring healthy gums, teeth and bone. Remove about 12 inches (30cm) of floss and wrap it around your middle fingers, leaving a 2-inch (5cm) strand of floss between them. 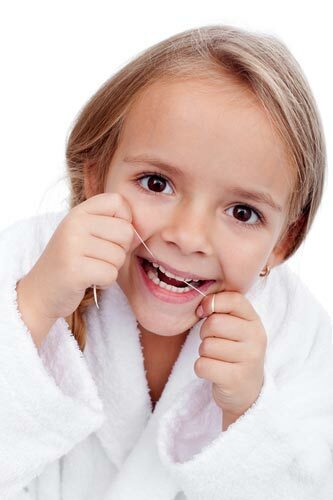 With your thumbs and forefingers, guide the middle strand of floss between teeth. Curve the floss into a “C” shape around the back-side of one tooth and front-side of the other under the gum line. Gently move the floss up and down, cleaning and polishing the side of each tooth. If this process is somewhat difficult, floss holders are a wonderful solution. Also known as Baby Bottle Tooth Decay or Nursing Caries, Early Childhood Caries is caused by exposure to too many cavity-causing foods and drinks and not enough brushing. It is often caused by allowing an infant or toddler to sleep with a bottle containing milk, breast milk, formula, juice, or soda. Additionally, it can be caused by allowing your child to nurse on-demand throughout the night. Another cause is allowing a toddler to have continuous access to sweetened liquids in a sippy cup throughout the day. These practices can lead to devastating dental disease in your child’s mouth. At Lone Tree Pediatric Dentistry, Dr. Nick and the team carefully and clearly discuss tips to follow in order to avoid this condition. Why does my child need sedation? The decision to utilize sedation to deliver dental care is made only after careful consideration and discussion with the child’s parents. In this discussion, we will discuss the risks, benefits and alternatives to sedation. Some reasons that your child may benefit from the use of sedation include low pain tolerance, extensive treatment needs, strong gag reflex, dental phobia, difficulty sitting still and physical handicaps. Many different types of sedation exist. The most mild is nitrous oxide/oxygen. Other types include oral sedation, in which a child takes medication by mouth, and general anesthesia. If you think your child may benefit from the use of sedation in delivering dental treatment, Dr. Nick would be happy to discuss your child’s options with you. Third molars, commonly referred to as “wisdom teeth,” may appear in the late teen years. Frequently, these teeth remain underneath the gums. Third molars have the potential to cause damage to the bone, nerves or teeth adjacent to them. Dr. Nick evaluates an x-ray, called a panoramic radiograph, to determine the probability that third molars may damage these structures. If the probability is high, then he may recommend having these teeth removed.